You may think that you’re “not in Kansas anymore” when you leave the familiar world of right triangles and Mr. Pythagoras to enter this new world of oblique triangles. 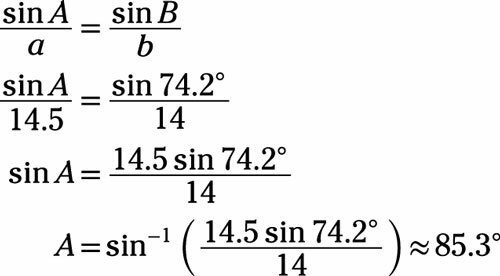 Trigonometry allows for some calculations that aren’t possible with the geometric formulas and other types of measurement. 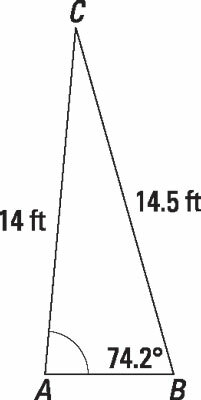 The Law of Sines and Law of Cosines are relationships between the sides and angles of triangles that aren’t right triangles. The applications you can solve using these new laws are many and varied. Whole new worlds are opened to you now that you don’t have triangle-type restrictions. The biggest challenge is in deciding which law to use, but even that is pretty straightforward. 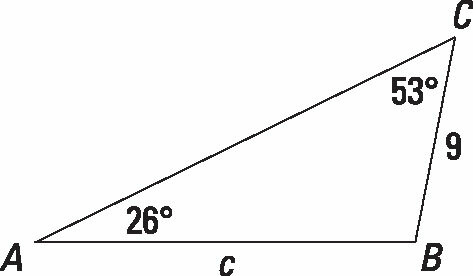 Use the Law of Sines to find the indicated side. Round your answer to the nearest tenth. A 14-foot pole is leaning. A wire attached to the top of the pole is anchored in the ground. The wire is 14.5 feet long and makes a 74.2-degree angle with the ground. What angle does the pole make with the ground? Round your answer to the nearest tenth of a degree. The pole makes an angle of about 85.3 degrees with the ground.